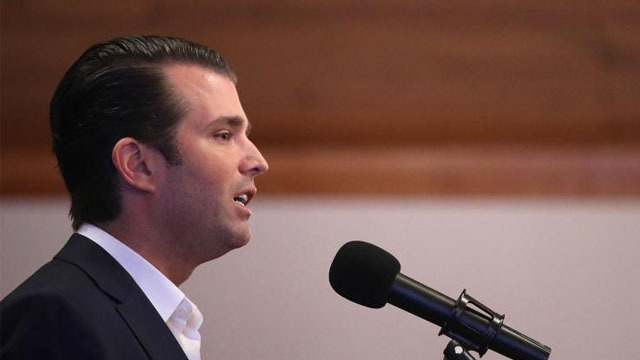 Donald Trump Jr. will be indicted and used by special counsel Robert Mueller to ensnare his father President Donald Trump, a former prosecutor predicted. When asked by MSNBC Live host Katy Tur on Tuesday whether she suspected that anyone in Trump’s circle, in addition to the president’s former adviser Roger Stone, lied to the committee, she suggested Trump Jr. without directly naming him. “I am concerned that other people lied to the committee and I wouldn’t be surprised if we find out through the Mueller investigation and report that he has identified others,” the Democratic representative said. “Who potentially do you think could have lied?” Tur pressed. After attending a Trump tower meeting in June 2016 where he was offered information about former Democratic presidential candidate Hillary Clinton, Trump Jr. told the committee he didn’t disclose the meeting to his father. However, Trump’s former attorney and personal “fixer” Michael Cohen, who pleaded guilty to making false statements to Congress last year, disagreed with Trump Jr.’s claims.